Lock in a great price for Ayothaya Riverside House – rated 8.7 by recent guests! The location is like a treasure place. Since I love hidden place and less people. So this place exceeds my expectation. It is located next to a temple which is not so well-known. But across a river (opposite side) are 2 well-known restaurants they should mention for guests who drive own cars to their property. 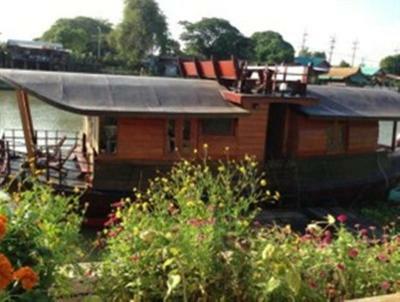 Those 2 well-known restaurants are "Tao Kae Lao เถ้าแก่ลาว" and "Mong Doo Rua Ayutthaya มองดูเรืออยุธยา". I ordered stir-fried mixed vegetables from them. and fried rice. Both dishes come a big portion and tasty. Unique and charming. Location very good. Accessible to tourist attractions. Beds were very comfortable. Owners and staff very friendly and accommodating. Enjoyed breakfast and other meals cooked by kitchen staff. Beautiful house in an amazing location. Right on the river and next to some beautiful wats. Near the floating market. Easy to get to the historic area. The staff are excellent and really helpful. It is great value. 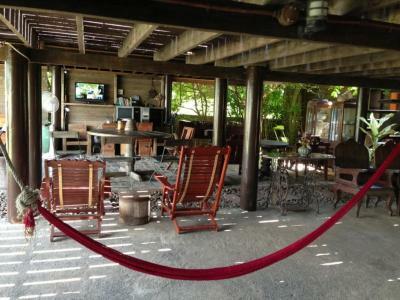 The setting of this property is beautiful - it's right on the river and so peaceful and quiet. The owner was helpful (he called me a tuk tuk to take me to the train station and made sure I was getting the right price for it). The shared bathroom is an open-air concept which is unique and kind of fun. 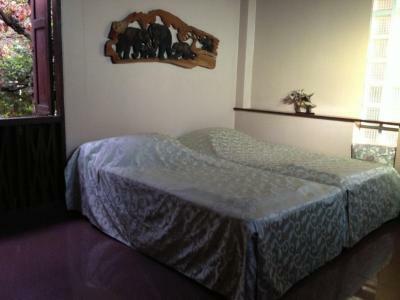 Room is very comfy to stay. 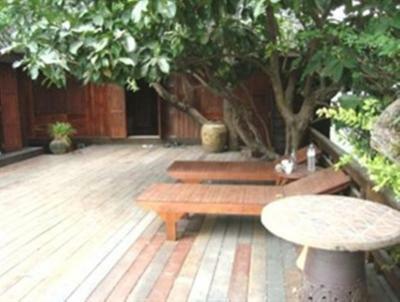 The outdoor bathroom is look simple but amazing! Staff are extremely friendly ! 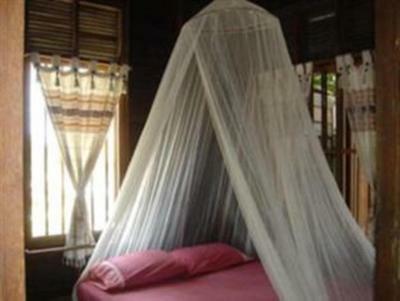 Conserve the culture and Thai houses with kind host and friendly staffs. The atmosphere, the boathouse, the river, the staff..in fact, almost everything. The place is very charming. 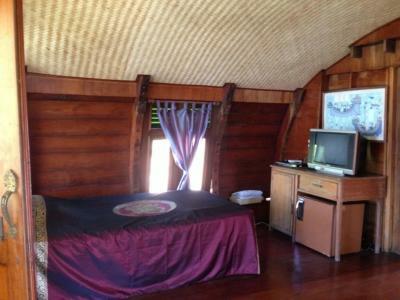 Despite my doubt about cleanliness, I still would like to go back to stay there. Friendly staff. Riverside location and good price food and drink. 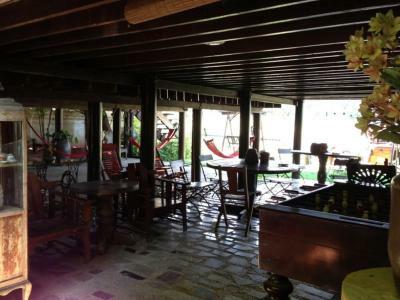 The staff, calm atmosphere, delicious food, rustical and confortable rooms with fan and and the wood building. Totally recommendable. Ayothaya Riverside House This rating is a reflection of how the property compares to the industry standard when it comes to price, facilities and services available. It's based on a self-evaluation by the property. Use this rating to help choose your stay! 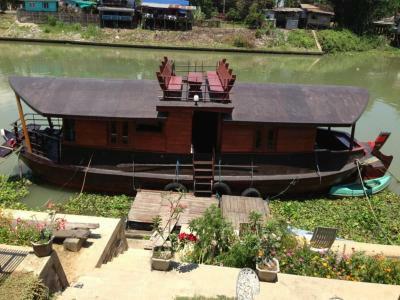 One of our best sellers in Phra Nakhon Si Ayutthaya! 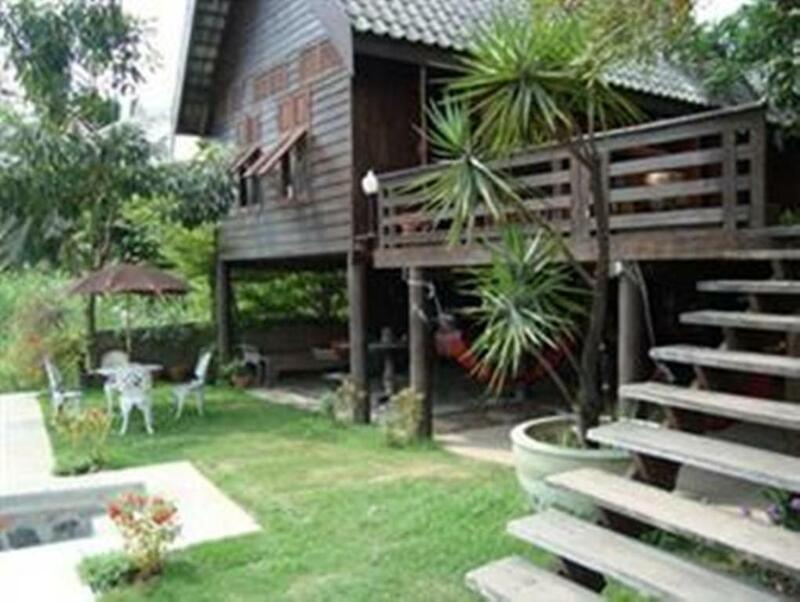 Located next to Wat Kasattrathirat Temple, Ayothaya Riverside House offers free Wi-Fi throughout the property. 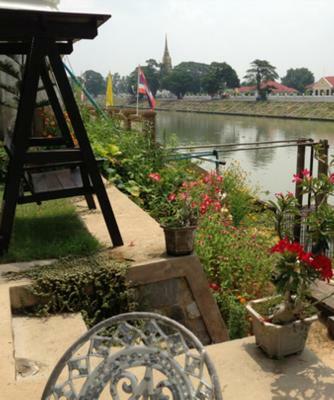 Guests can take a stroll in the garden or simply unwind by the river banks. 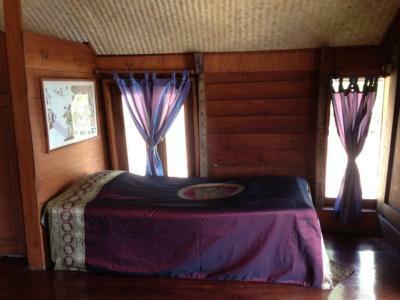 Each unit is equipped with a choice of air conditioning or fan. 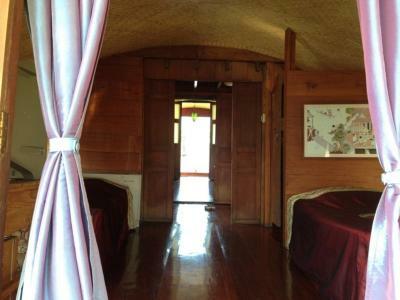 It comes with either an private bathroom or shared bathroom. Selected rooms have a TV, fridge and balcony. A range of local restaurants can be reached within walking distance. 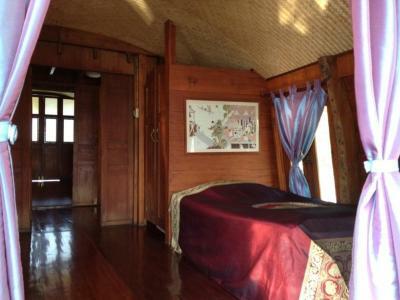 When would you like to stay at Ayothaya Riverside House? 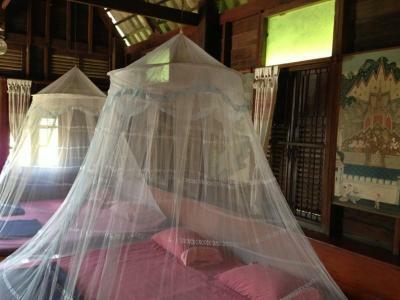 Fan room includes a mosquito net and shared bathroom. 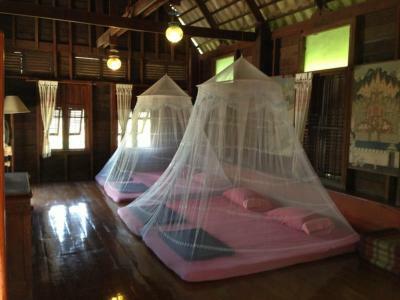 Larger fan room features a mosquito net and shared bathroom. 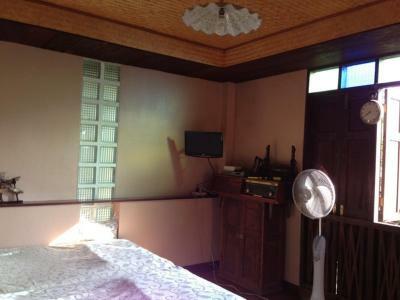 Larger air-conditioned room features a fan, TV and balcony. Shower facilities are included in an private bathroom. 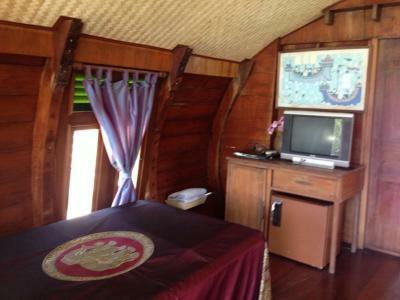 Room in a boat offers air conditioning, TV and fridge. 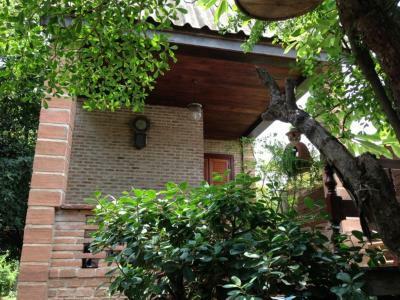 A balcony with river views and private bathroom with shower facilities are included. 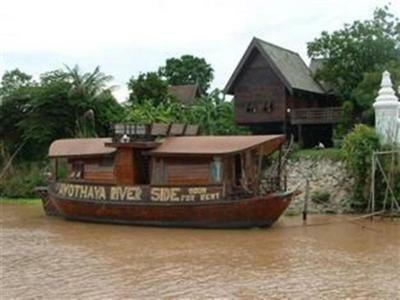 House Rules Ayothaya Riverside House takes special requests – add in the next step! The hotel requires prepayment via bank transfer. Guests will receive a direct email from the hotel within 48 hours of booking with the bank detail. To confirm the reservation, payment must be made within 48 hours once email is received. Very clean an very beautiful room. The owners very lovely and friendly people make everything to feel you like at home. Very beautiful view on the river. Not so much a dislike, but something to note. Where it is a traditional building there are no ceiling partitions between the rooms, so if you are a light sleeper you may be woken by your neighbours. 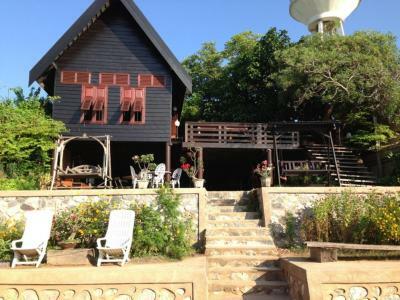 Really friendly hosts, great location just off the island but easy enough to cycle to all the main attraction, you can even walk to Wat Chaiwatthanaram. 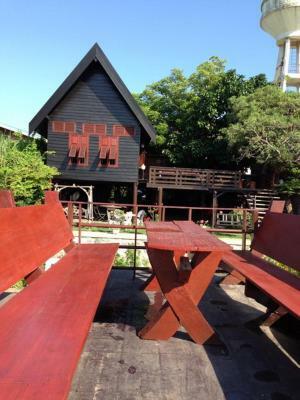 Bicycles are available to rent at the property for 50THB for 24 hours. The setting on the Riverside is a lovely place to relax and watch life on the river go by. Only downside was distance from bus station, but this is outside of town for most hostels and guest houses. 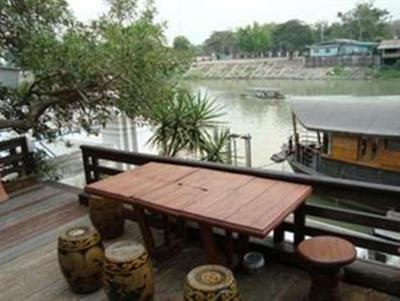 Also the guesthouse is over the river so it is necessary to have a walk or hire a bike to get most places. The situation of the property and the views were lovely, perfect to read a book in the hammock. The staff went above and beyond and were so friendly, the best hosts we have had so far. I was ill during my visit and was trying to locate some medicine that we couldn’t find in the 7/11 so my boyfriend asked one of the staff/owners where we could find it, who kindly provided us a cup out of her own medicine cabinet. I also loved singing whilst the guy owner played the guitar. Both me and my boyfriend really enjoyed our stay. Also bikes for hire which are easy to ride to the historical park. It is not exactly that I don't like. I would say if they add shampoo into bathroom. It would meet standard. Currently they provide only liquid soap. Generally, hostel provides shampoo and soap. Some hostels provide extra stuff like ears bud, shower cap, toothpaste and dryer. Lovely traditional home by the river. Very nice hosts. Nothing, everything is perfect for me in this place. The room was crammed with 5 pieces of furniture, one cupboard was locked and it had an old 50's radio cabinet on top - nothing to do with us. The furniture is all very old not antique. The bed was pushed into the corner. 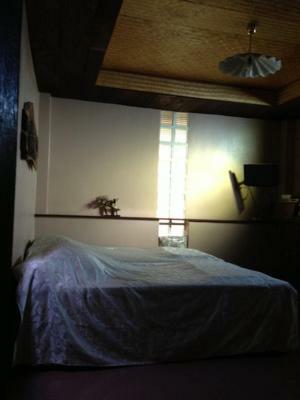 No top bedsheet, only a blanket which we don't think was washed from the people before. No proper towels for the bathroom. 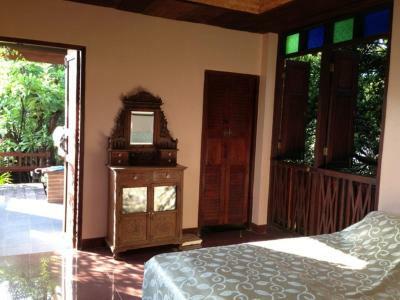 The property is well overpriced at Bt1500 per night and no breakfast. The room had a glass panel with no curtain and the security ;light shone through all night so the room was not dark. The water pump for the property next door was near our room and kept recharging all night keeping us awake. Much of the "old" furniture in the general area was covered in cobwebs. We liked the location. Owner and staff were very helpful. Plenty of parking. As seniors, boat stay was interesting but some what challenging. Boats plying on the river could be busy, and noisy at times. It is a little bit hot in the room from 11-3, but its a beautiful temeperature all night. Extremely sweet and welcoming people. Always ask how you are, help you finding your way, invite you to sit down and have a chat, do your laundry very well (paid). They have a great kitchen. Their food was among the best we’ve had during our month in Thailand. 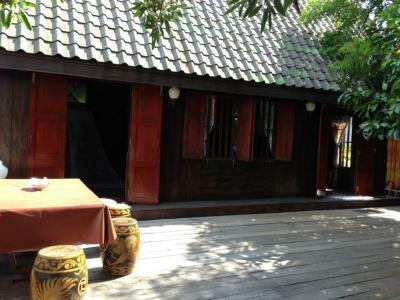 The hostel itself breathes peacefulness and friendliness. For the ones who need it: WiFi is really good too. Need earplugs to sleep! Really noisie 24h per day! The staff is amazing! The site is beautiful!